Igor Vojinović is the chairperson and leader of the Kosovo Serbian National Movement Fatherland (Otadžbina), which has put up long-lasting resistance against the activities of Kosovo Albanian authorities in the north of Kosovo. He works as a professor of history at one of the schools in Kosovska Mitrovica. He is a critic of ecumenism in Serbian Orthodox Church, the removal of Vladika Artemije, the Bishop of Raska and Prizren, as well as the policy of current Serbian Government and an adherent of as close collaboration with the Russian Federation as possible. He was a member of the delegation of Kosovo Serbs during negotiations with Patriarch Irinej in March 2010. 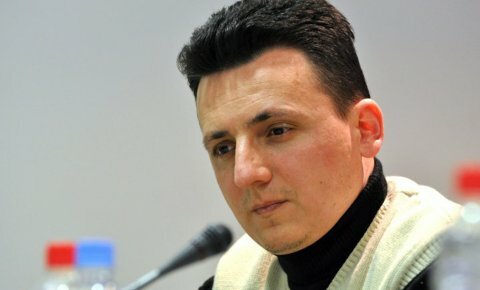 At the beginning of January 2011, Kosovo Police Service made a swoop in his house during which his belongings were seized and he was meant to be arrested. He managed to flee and currently he has been hiding at an unknown place. The editorial team of DespiteBorders.com, however, succeeded in contacting him and conducting an interview with him about the current development within Serbian Orthodox Church and political situation in Serbia with focus on Kosovo. At the beginning of January, a swoop of Kosovo Police Service (KPS) was conducted in your house during which you were meant to be arrested, but you managed to flee. While giving this interview, you are still a fugitive. Could you tell us at the beginning of the interview how the aforementioned events came about? KPS came upon the request of a priest from Kosovska Mitrovica who betrayed Christ and Serbia and whom I had allegedly threatened in a leaflet. That sounds like a joke, they have been looking for fabricated reasons in order to storm into my house, search it and take me quickly to Albanian prison. Waiting for the truth coming out, they would have beaten me up meanwhile and, who knows, when I would have been allowed to leave the prison. Fifteen days have already elapsed and they haven’t found any evidence of me committing a crime yet. In my notes, which they seized, they only have found patriotism and belief in Christ. Furthermore, they found stickers with portrait of Radovan Karadžić and Ratko Mladić and similar objects which you can buy in a newsagent in the downtown of Kosovska Mitrovica, at Shumadija Square, and which are mostly bought by foreigners. Those priests expelled four catechists for taking part in a liturgy served by Vladika Artemije. The said catechists have been leading around 20 children, one of them completed his studies at two faculties, the second one is the founder of our movement. The remaining catechists were forced to subordinate to them instead of God. These priests are primarily thieves, God forgive me. They only think of money and power and have betrayed Christ and Vladika Artemije. When I was in Kosovo in autumn 2009, shortly before the death of Patriarch Pavle, I heard from several sources that the governmental circles of Serbia loyal to the US and the United Kingdom cannot wait the moment when he passed away. According to this statements strong pressure of these powers on the Serbian Government to exert its influence inside SOC in order to change the inside conditions was to be expected following this event. Did you register that these prognoses were met? Yes, these prognoses were very precise. In your statement from 2010 you said that ecumenical sentiments in SOC, which had been established inside it under the influence of Vatican, were behind the removal of Vladika Artemije. Do you think that the influence of Roman Pope is sufficiently strong for such interventions in the life of Serbian Church? The influence of Roman Pope not only on the Serbs but also on the whole world is tremendous. Ecumenism has been spread similarly to New Age ideology. Without the participation of the regime in Belgrade Vatican wouldn’t be capable of breaking up SOC anyway. Former Vladika Artemije is the representative of conservative stream inside SOC. In your opinion, is there a connection between his conservatism and his removal? Pre-enlightened Vladika Artemije is not a former Vladika. His removal was carried out in conflict with the canon and constitution of SOC on the basis of calumny. He is not conservative, but orthodox and patriotic. That’s what they object. He doesn’t recognize EULEX, the Albanian pseudo-state, he forbade clergy to forge links with official representatives who had recognized Kosovo and expelled Joe Biden from Gračanica. The Artemije case has continued for a long time now. One of its milestones was the accusation of embezzlement that had been allegedly committed by his close co-operators. How do you perceive the accusations in question? Accusations regarding the embezzlement are ridiculous. Itʼs an old western method within the meaning of the saying “the thief screams catch the thief”. They amount to falsehoods which don’t lay the groundwork for removal, expelling or bullying in fascistic manner. All people in Kosovo and Metohija know that the money in question was stolen by the wife of the priest in Zvečan, (todayʼs Bishop of Raska and Prizren, editorial note) Teodosije and many other priests – thieves. Greek courts have acquitted father Simeon Volovsky, who has been accused by the Belgrade regime, which set free his godfather Petar Suboticky after one year long custody that he had been taken into without evidence. In internet discussions there are opinions that the successor of Artemije, Vladika Teodosije, was elected out of Tadićʼs will. Do you agree with such a point? According to EU formula dictator Tadić participates in the sessions of synod and archiepiscopal assembly of SOC and influences them. The question remains to what extent these two institutions are holy after the betrayal and breach of the canon law. Do your contacts with Artemije carry on? What is his current position among the priests of the eparchy of Raska and Prizren and among the Serbs in Kosovo like on the whole? Have all priests subordinated to the new Vladika in this eparchy according to your information? Some of our members still attend Vladika Artemijeʼs liturgies, his influence is still big, although not a power. Almost the whole of priesthood, except for the temple Dečani controlled by shiptar priest Sava Janjić, have left along with him. Some of them were forced to betray involuntarily and recognize Teodosije, who was designated in a non-canonical way. He organizes the expelling of the Serbs and obeys the Albanians. He takes part in the creation of “the Kosovo society”. Do you consider the members of archiepiscopal assembly and holy synod to be still your spiritual leaders? For us, bishop Teodosije is a Shiptar (defamatory expression of the Kosovo Albanians, editorial note). Synod and archiepiscopal assembly are controlled by Tadić, the EU and Vatican. They amount to traitors of Christ and the Nation! In December 2010, the information about the intention of Artemijeʼs adherents to establish new, genuine Saint Sava Church was released. Do you support this step? SOC is genuine Saint Sava Church. Unfortunately, it is under the control of the guru of New World Order at the moment. We have to expel them from church somehow, because there is no place for them inside. Without the Russians, however, it is not possible. The Serb nature as a part of the entire Slavic nature has to become the basis of the life of every Serb again. It is only thanks to prayers to God that we can win. If we fail, we shall end up in infernal tortures. For every Serbian conservative, orthodox belief represents something which he fixes on and regards as the core of his national identity. How will the Artemije case affect the determination of the Serbs to defend Kosovo as a part of Serbia? Vladika Artemije exerted great influence causing the Serbs staying in eparchy of Raska and Prizren. These new illegal and illegitimate people only think of money and agree with evil. They have been expelling the Serbs, delivering threats, accusing falsely and storming into houses along with KPS and EULEX. In the essence of an orthodox Serb there is pure Christian dogma, the so-called Svetosavlje. By the way, besides the orthodox Serbs, there are also Serbs – Roman-Catholic, Muslims and atheists. That is not a problem, problem occurs only as long as they become “Croatians” or “Bosnians”. And ecumenists aren’t genuine Catholics, they are Satanʼs evil. Your movement is practically unknown in Slovakia, except for one statement released in several non-mainstream media. Could you elaborate on its activities and the methods how you strive to help the survival of the Serbs in Kosovo? It is not our goal to be well-known, but to do what we can. We cannot afford being too strong, because they would destroy us immediately. We rather have to act like wasps, stinging into decisive situation a little, and after that there will be counterrevolution. We have been writing our opinions, commentaries, letters, protests, pleas, requests, announcements, statement, posters, graffiti and sticking stickers. We manufacture t-shirts with patriotic printings. We take part in meetings and protests and aren’t financed by a single dinar. How do you assess your collaboration with local government bodies? Do they support your activities? Serbian National Council has backed us, although our movement keeps falling apart. I too was nearly sent to Albanian prison as enemy of the “Kosovo state” No. 1. But they forgot that I was the ancestor of Baja Pivljanin, the greatest Serbian Hajduk, who comes and escapes as he wants. I injured my hand and leg. Fifteen of them encircled me, but they didnʼt catch me. What would then any of my relatives, who is stronger and more skilful than me, have done to them?! They would have tossed them around, Albanian Servants! Given your activities and requirements, you cannot rely on the assistance of Belgrade. Instead of that you pin your hopes on Moscow asking it to grant Russian citizenship to the Kosovo Serbs. Are there any official or unofficial reactions of the Russian Federation in the given context? In an unofficial interview we learned that there was no way how to obtain Russian citizenship, but Russia would help us. We were disenchanted about that a little bit, but without Russia there will be no Slavs anyway. Those who don’t see it are either blind or wicked. One of the slogans which may be seen during a walk across Kosovska Mitrovica is “Yes for the EU, but with Russia”. Among local Serbs there is a widespread opinion that Belgrade has sold Kosovo for the status of a candidate country for EU accession and that Russia amounts to the only redemption for the future. Nowadays, Russia will certainly not unleash war because of Kosovo. How do you assess real possibilities of Russian intervention? The regime in Belgrade is traitorous, however, there is a possibility of Russian intervention if the citizens of the Russian Federation are in danger. There is a certain number of families of Russian origin living In Kosovska Mitrovica. Those would gain Russian citizenship automatically, but for some reason they are not interested in it. How do you assess the cooperation and assistance on the part of Russian voluntary and patriotic organizations? The Russians are helpful, but not to a sufficient degree. Looking at the condition we are in, however, it is no surprise: the Russians cannot be greater Serbs than the Serbs. The KFOR commander stated at the end of December that the Americans would take over the security responsibility also for the north of Kosovo. What is your stance on the given matter like and how can you respond to it? If the Americans assume control of the north of Kosovo and Metohija, it would mean definitive end. At present, it is a French sector. However, if it becomes American one, we can hardly resist such strength. Your organisation requires immediate withdrawal from all treaties with the EU and NATO. How do you perceive the feasibility of the fulfilment of the said requirements and in what way do you fight for them? Somebody has to require the interruption of all relations with the EU and NATO, because of conscience and God and nothing else. Even though the nation is fed up with the EU. Your movement organises protest activities aimed against the presence of the representatives of international forces and the so-called Kosovo institutions in territories inhabited by the Serbs. The result was physical clashes for now and we may assume that your activities aren’t very much to the liking of the forces active in your region. What are their countermeasures like and to what extent do they threaten your further activity? Countermeasures of Albanian authorities are expected, but they arenʼt efficient without the participation of Serbian traitors. They became dangerous only after they had been involved in bulk with the assistance of the regime in Belgrade. KPS, KPA (Kosovo Property Agency) and non-governmental organisations are taking the north of Kosovo and Metohija with the permission of Belgrade. Recently, there has been kind of abundance of media coverage concerning the criminal background of the top representatives of the so-called Kosovo state and their involvement in trafficking of organs of captured Non-Albanians. Nowadays, the Council of Europe has been factually confirming the fact which has been know for a long time, however, the ill informed European public is rather outraged. How do you perceive the possibilities of the shift in the apparently pro-Albanian orientation of European structures? I don’t see the problem in the EU, in Russia or in the Albanians, but in Serbian traitors, who prevent every change for the better. Everybody knows who Tači is, but Tadić and his people brawl, as it were, only to prove his innocence. The same holds for Teodosije and his priests. European observers ascertained non-democratic principles of the so-called Kosovan elections and numerous cases of election result doctoring. How do you perceive the results and course of these election and the attitudes of western observers, which as if also signalised shift in the mostly contra-Serbian orientation of European structures? Talking about democratic principles in some “Kosovan elections” is tragicomic. They are illegal and illegitimate. Those who do so recognize thus the theft of the holiest part of Serbian land through long-lasting crimes and genocide even calling it “republjik Kosova”! It is unfortunate to talk about democracy in this context. The West tries to implant discipline into the Albanians, but they wonʼt succeed. Representatives of the Ministry for Kosovo and Metohija recommended the Serbs to take part in Kosovo elections, which is no surprise in view of the statements made during previous elections. How do you explain the minimum feedback of Serbian people as regards such recommendations? The regime in Belgrade upholds all evil and every betrayal. It drives the Serbs to suicide. They separated artificially Kosovo and Metohija into north, centre and south. They surrendered everything below Ibar to the Albanians, now itʼs our turn. How do you comment the activity of Serbian parties that participated in Kosovo elections? I heard, for instance, that Independent Liberal Party of Petar Miletić got several hundred thousand euro from Hashim Thaći for election campaign. Is this information true? That wretched Miletić took money and his party is in Albanian institutions, He works on the destruction of his own family and own nation. There are more people like him. He has already been shot three bullets in his leg and does still the same. Disaster! Your organisation is well-known for a priori refusal of negotiations with Kosovo representatives, which, from your point of view, grant legitimacy to the existence of bodies of the so-called Kosovo state. At present, several reports were released that Belgrade and Pristina will lead negotiation with Albanian authorities within the meaning of the resolution of the UN Security Council that was agreed on during intermediary mission of the EU. How do you perceive the given news, not only in the context of your aforementioned orientation, but also in the context of the possibilities of solving the situation in Kosovo (security and rights of the Serbs, protection of cultural heritage etc.)? The regime in Belgrade agrees with everything which is antihuman and anti-Serbian and so it conceded even to these negotiations. To demand human rights for the Serbs in “the Kosovo state” is high treason. Those who do something similar in Montenegro, Bosnia and Herzegovina and the former Yugoslav Republic of Macedonia do not call themselves Serbs any longer, but Montenegrins, Bosnians and Macedonians. Those who want “the Kosovo state” to serve their Albanian masters are Shipitar-s and nothing else. How would you comment on the functionality of the Ministry for Kosovo and Metohija and the impact of its activities on real situation in the north of Kosovo? The Ministry does no good thing, to the contrary, it destroys everything good that Slobodan Samardžić achieved in terms of his mandate. This ministry has been currently serving Thaći. In Kosovo elections the party of Albin Kurti, which adheres to the establishment of the common state of Kosovo and Albania, took third place. The party enjoys the support of US diplomat William Walker. An interesting figure inside it is Florin Krasniqi, who supported financially the Albanians during the war. How do you perceive the background of this party? Albin Kurti is a fictitious extremist and martyr. He is allowed to do everything and has access to anything. He has a lot of money and when he is in prison, it looks as if he was in a hotel. His activity equals to Hollywood production. I do not consider this the biggest problem. Serbian traitors and Albanian serfs are the biggest problem. Those who stormed into my house in Albanian uniforms and have Serbian names and surnames. The Chief of Serbian Interior Ministry for Kosovo and Metohija accompanied them, unofficially in plain clothes. I was reported by Teodosijeʼs pope on the basis of a leaflet written by a priest superior to him. He said I had threatened him and the former catechist of Vladyka Artemije had assisted me. They even didnʼt have permission to house search, property seizure and arrest, not even from an Albanian judge. When they attacked me, I was holding my fifteen month old son in hands. They hardly agreed with the release of my wife and son. They stole my computer, cell phone, camera, documents… I just escaped them. It was all orchestrated and without any evidence. In the end twenty of them were standing on jeeps around my house and quarrelled with my parents-in-law and neighbours. They have been withholding my belongings for twenty days now and reject to hand them over to my attorney. They have no evidence of criminal activity. However, that is not of their interest. Thanks to the support of Belgrade, KOC has become thus much arrogant that it started to arrest the Serbs. The fact that it does so at the instigation of Teodosijeʼs priests is a proof of their collaboration with “shiptar” quasi-state!